Hublot is celebrating Ferrari’s 70th anniversary with a new watch that was designed in close collaboration with the Italian car maker’s design team. The case was designed at Ferrari’s workshop in Maranello, Italy, using the same creative processes used to develop a new sports car. 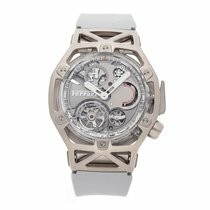 The Techframe Ferrari Tourbillon Chronograph is the first product designed by Ferrari that is not a car. Like the body of one of Ferrari’s racing cars, the case is all about aerodynamics, stripped to the bare bones, with negative space: essentially, it is skeletonized. The crown is positioned at 4 o’clock, which creates the illusion that the case is moving at high speed. The large, lever-style pusher at 9 o’clock adds to the aerodynamic aesthetic. The strap is interchangeable in a fun way: it unbuckles like the releasing of a seat belt when the red buttons at each side of the lugs are pressed. The lever pusher and lug release buttons are red – P485 Ferrari red, of course. It contains the manual-wound caliber HUB6311, a monopusher chronograph with a flying tourbillon escapement – although technically it only looks like a flying tourbillon.